Jordan will not take in Syrian refugees fleeing a renewed offensive by the Bashar al-Assad regime in southwest Syria. Pro-Assad forces are moving deeper into the province of Daraa with support from Russian airstrikes, causing Syrian citizens to flee the war-torn region. Jordanian government spokeswoman Jumana Ghunaimat said the kingdom has already absorbed large numbers of Syrian refugees and is working with the U.S. and Russia to protect its national interests, according to the Associated Press. Jordan has taken in about 660,000 registered refugees, but the country says the number of displaced Syrians in the kingdom is in reality twice as high. The Russian Defense Ministry claims Syrian rebels attacked a dozen locations where insurgents switched allegiances to support the government. Pro-Assad forces repelled each assault without any loss of life among government troops. 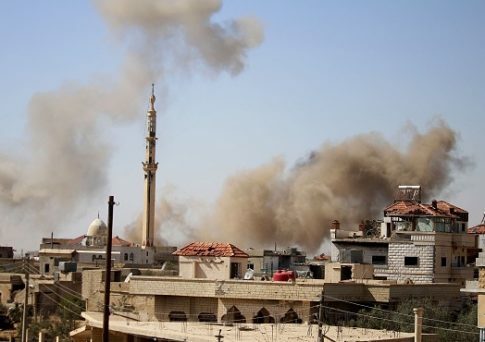 The Syrian Observatory for Human Rights (SOHR) said airstrikes and shelling reached Daraa, the eponymous capital of the province. Anti-government protests in 2011 began in Daraa as part of the Arab Spring. SOHR also reported that over two dozen civilians have been killed since the start of the offensive and more than 17,000 people have fled their homes. Last Friday, the Syrian government dropped barrel bombs on rebel-controlled areas in southwestern Syria for the first time in a year. The offensive threatens a de-escalation zone created by the U.S. and Russia last year. While the U.S. has voiced opposition to the offensive, officials told allied rebels not to expect American military intervention to halt it. The U.S. State Department stated it is "deeply troubled by reports of increasing Syrian regime operations in southwest Syria within the boundaries of the de-escalation zone." Department spokesperson Heather Nauert warned Assad to refrain from violating the de-escalation zone and called on Russia to restrain pro-regime forces from further military activity in the region. The State Department has been in contact with the Russian government to express concern about the offensive, according to the Wall Street Journal. "This is once again an example of Russia flouting arrangements it has entered into with no regard for civilian lives," a State Department official said. One rebel leader in Daraa said Russia is clearly violating the de-escalation agreement. "They are aware that the regime is not capable of advancing on its own. The airstrikes are targeting civilians and they are trying to intimidate them," said Saber Sifer. U.S. officials said it is unclear if Russian and Syrian airstrikes in southwestern Syria are laying the foundation for a major ground offensive or are a temporary effort to gain leverage. Officials think Assad could be trying to force a new diplomatic arrangement, one that would grant the Syrian government control over southwestern Syria without a drawn out, destructive battle. This entry was posted in National Security and tagged Bashar al-Assad, Jordan, Syria. Bookmark the permalink.